Pundits and prognosticators, strategists and seers all said it couldn’t be done. Incumbents who garner positive ratings from fewer than four in ten voters and who post double-digit deficits in match-ups against opponents (in public polls) are not supposed to win—and they usually don’t. In fact, combing through the history of polling it is hard to find someone other than Senator Harry Reid who accomplished that feat. Going into the 2010 cycle, most analysts were giving Senate Majority Leader Harry Reid virtually no chance of re-election. Our assignment was to develop a strategy that would beat the odds and prove the prognosticators wrong. The first element in that strategy was an early run of positive ads designed to break the non-stop stream of negative news coverage by re-introducing Reid to voters, using his biography to help relate him to their economic straits and laying the ground work for our positive appeal by telling stories about how he had used his clout as Majority Leader to create jobs in the state with the nation’s highest unemployment rate. However, we knew from the beginning that we could not allow this campaign to become a referendum on Senator Reid. A second element of our strategy helped our preferred opponent to emerge from the primary and the campaign brilliantly seized on errors by the favored Republican which helped produce an upset victory by Sharron Angle. Knowing we wanted the race to be a referendum on our opponent, immediately after Angle emerged victorious from the primary, we conducted both focus group and survey research plumbing her vulnerabilities. Armed with this information, we crafted a message centered on the premise that Angle was too extreme for Nevada. We conducted extensive ad testing to ensure that our research was successfully translated into effective spots, correcting flaws and sharpening our message. This well-planned, hard-hitting and effective media defined Angle as extreme, a characterization from which she never recovered. As the ad campaign began in earnest, we conducted frequent tracking polls to measure changes in the electorate and make mid-course corrections. Reid ended up shocking the political establishment by winning on November 2nd —and it wasn’t even close. During the course of our research for Senator Reid’s campaign, we interviewed nearly 15,000 Nevada voters in the six weeks preceding Election Day. Our analysis of this data sheds important light on why ours proved to be the only accurate polls in the race. First, many pollsters, especially so-called “robo-pollsters,” restrict their sample to just land-line telephones—we include cell phone users because it makes a real difference. By failing to call cell phones, many pollsters failed to reach a segment of the electorate that was younger and significantly more liberal than the electorate as a whole. Indeed, our research revealed that Reid’s margin over Angle was 21-points larger among cell phone users than with those contacted on a landline. Second, in order to reach a truly representative sample, pollsters must make repeated attempts to contact voters – otherwise, you are left a sample of only those who are easy to reach. Our data shows that harder-to-reach voters were also more likely to support Senator Reid. Finally, a pollster’s definition of “likely voters” can have a huge impact on their results. For example, because mid-term elections tend to have significantly lower turnout than presidential elections, some pollsters chose to restrict their samples to those who voted in both the 2006 and 2008 elections. These “consistent” voters skew older, more conservative, and more Republican than the electorate as a whole, and are much less likely to be Hispanic. 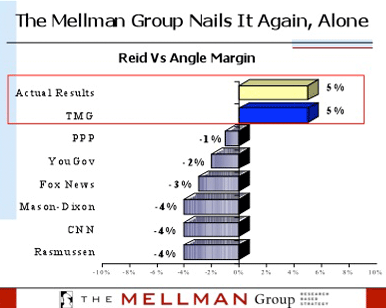 Indeed, in our own research, Angle actually held a 1-point lead over Reid among “consistent” voters. But after analyzing voter behavior in past mid-term elections, we also incorporated into our “likely electorate” a sizeable number of voters who voted in just one, but not both, of the past two elections, who also claimed to be “almost certain” or “very likely” to vote in 2010. Among these voters, Reid held a 17-point lead. An overly restrictive screen of “likely voters” also led to a sizable Republican bias. By helping to craft an effective message and by providing in-depth and accurate polling to Reid’s superb campaign team, we helped to provide a rare bright spot on a bad night for Democrats. Moreover, as described in a Las Vegas Sun article headlined, “How Harry Reid’s Pollster Got It Right,” ours were the only surveys which correctly projected the outcome.